40% of 4th and 5th grade girls in America right now are on a diet. Re-read that sentence and let the reality of it sink in. It’s a fact: almost half of our 9 and 10 year olds are actively trying to change their body for no other reason than that they believe it is wrong, flawed, and inferior. And unfortunately, that early age isn’t where the problematic thinking starts. A recent study shows that already by age 6, girls start to express concern about their weight or shape. I’m pretty sure that while I absolutely grew up with low body image self-esteem, when I was 6 years old I was more concerned about hiding our unofficial Construction Paper Chewing Club (strange I know... we thought it was so rebellious!) from Ms. Cunningham than dieting. Given the choice again, I’d absolutely take the opportunity to worry about our “defiant, statement making, paper chewing” group of 1st graders over starving my body at 6 years old. Every time. You might already know about these statistics and how prevalent they are in our society. If you’re here, you probably have children of your own and already see worrisome behaviors around body image or are concerned about how to minimize them when they start to surface. Often, the go-to tip for parents is to “role model, role model, role model!” Y’know the advice: you have to walk the talk and then your children will pick up the great messages along the way! And this is totally true, but also one of the hardest things to do. LOVE YOURSELF AND YOUR CHILDREN WILL LEARN TO LOVE THEMSELVES TOO! they say. But sometimes this small detail is forgotten: that mandate can feel totally impossible. I mean, over 91% of cisgender women are unhappy with their bodies (read: almost all female role models) so that scary statistic about elementary kids practicing deprivation/dieting behaviors? It’s really not surprising. We’re ALL caught up in the destructive cycle of self-hatred and adding the pressure of needing to “fake it till you make it” for the little ones can feel overwhelming. I’m going to of course advocate for you to continue to learn to love your body, because… you’re worth it. I’ve dedicated my life to body image activism which means I have been doing research around our society and how we feel about our bodies (and why? and how do we fix it all?) for years. I do this because I believe that physical self-hatred is unnecessary and the reason we continue to obsess over it has everything to do with a larger plan to keep us pre-occupied, distracted, and unable to see/reach our true potential. So yes, please keep working on yourself! You totally deserve it. But you don’t necessarily need to add any more pressure to raising a family, and so I’d like to offer you my top five tips for how to instill body love in your children and teens in the real world… besides role modeling. This is something that can be done from the get go. It’s incredible to me how easily the human brain can be conditioned to believe that a “certain look” is the only desirable look. This can happen without a word being spoken; the simple elimination of everything except for our “beauty standard” in media is enough to instill belief that until we look like the people in movies or on magazines… we do not deserve to be seen. To counter this, we simply need to fill our line of vision (and our children’s) with as many diverse bodies as possible. Bring all sizes, shapes, ages, sexes, genders, abilities, races into your home and normalize the incredible diversity in our world. Search out posters for your walls that includes all sorts of bodies. Buy movies that include all abilities (and ClaraBelle Blue). Purchase books that talk about all genders, sizes and races (example: these 6 body positive books for kids, the Know Yourself series, THIS BOOK and some of these feminist coloring books). Give your child a world in which they belong and deserve to be seen! When I was 11, I rose early in the morning (5:30 am) to do go participate in a step aerobics class with adults before school. Just me... and all of my friend’s mothers. No other kids showed up because 1.) What kid WANTS to be up at 5:30 at that age? and 2.) I was the “chubby” one of my friend group and therefore needed the extra help. While I was not excited about the early class time, I was even less excited about my body size; I had always been the fat kid and felt like I needed to “fix” this problem before I could have permission to feel good about myself. While my decision was supported with rides to and from, no one “made” me do this necessarily... but they didn’t have to. I grew up thinking that my large body was inherently bad (thanks Society!) and that exercise, while punishment, was also the solution. I’m sad to say that I still continue to have mental barriers around exercise classes as an adult and it’s all because they were used as self-punishment while young. Even though I have spent years redefining my worth and the joy that can be felt from moving my body… this initial introduction has stayed with me and continues to hinder my relationship with exercise. So with this in mind I encourage you to help your children see moving their bodies as a wonderful, beautiful, and fun thing COMPLETELY SEPARATE from needing to “fix” anything. “Encourage your daughter to run because it makes her feel less stressed. Encourage your daughter to climb mountains because there is nowhere better to explore your spirituality than the peak of the universe. Encourage your daughter to surf, or rock climb, or mountain bike because it scares her and that's a good thing sometimes. And of course, if there are movements that your child is unable to do, celebrate the ones that they can. There is no hierarchy when it comes to movement! And I say: AMEN you genius boy, you. When I lecture at universities, I KNOW that the audience is familiar with photoshop… but I still make time to talk about it and it’s insidious influence anyways. Because image manipulation is so pervasive that even when we “know” about it, we don’t often understand how much it affects us. Have this conversation with your child as early as you like, and keep having it! This is a conversation that I wish I had as a child and so PROPS to that parent and her daughter! I’ll never forget the first time I was allowed to shop for clothing ALL BY MYSELF. At 13, my Mom was my constant style companion and while I appreciated her input (and willingness to clothe me) I was stoked to have complete freedom to choose any piece of clothing I wanted from Sears. I left the store with a pale green cotton shirt covered in tiny flowers. And while I loved the color, the “cool factor” for me came with the scoop cut neck and puffed capped sleeves—- all made possible with elastic that sat snuggly around my upper arm. My suggestion: try eliminating “the word flattering” from your vocabulary. Forever. Don’t buy into the fact that bodies have to look a certain way in order to be okay. If bullying happens because of what your child wears, teach them how to talk to an adult at school and then preach and practice self-love and advocacy at home! 5.) Help your child see themselves as a whole person. And of course, there is always the importance of not focusing on appearance at all! This may sound hypocritical coming from someone who just spent the majority of this article talking about “looks”, but hear me out: our bodies are important and if we ignore them all together we’ll be sorely inept at existing in this world. We must learn to love and appreciate them as well as counter negative messaging! But we’re also so much more than our outsides and children especially need this message. I know this. You know this. So… how do we do this? I’m not going to ask you to enroll your child in every extracurricular activity—- that’s not possible for some, nor is it entirely necessary. 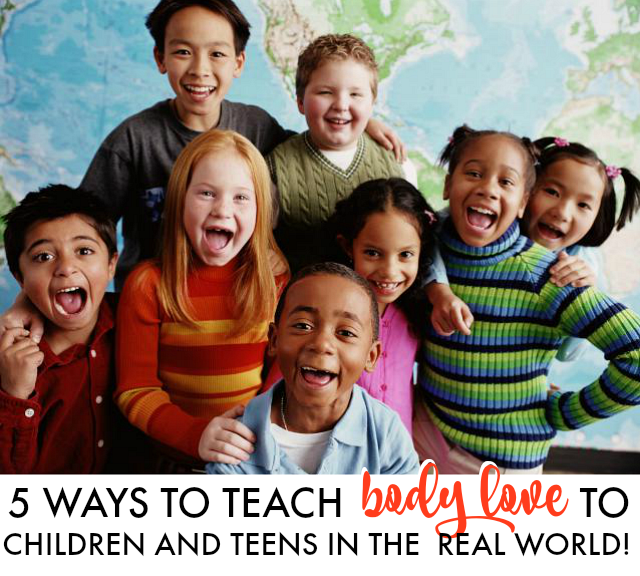 Lauren Pinto and Meagan Kimm are two teachers in California that have developed an amazing curriculum for school-aged kids that teaches self-esteem and body love. They suggest that you put value in a variety of different areas for your child and have conversations that engage their uniqueness. Lauren and Meagan encourage small things like: asking their thoughts on the mural you pass on the way home, spending time together doing community work and volunteering, having conversations about sports and teamwork, and appreciating the miraculous things our bodies can do—- like healing cuts and regenerating skin! Teaching kids the basics of anatomy at an early age can help with self-confidence. Knowing that we’re all made of the same stuff, no matter what our size, is empowering. Our bodies are more than beautiful: they’re necessary for living in this world and experiencing a wonderful life! This is something I was blessed to have growing up and looking back, I know it was my saving grace. Whatever you decide to implement within your home, I hope you remember that your best is good enough. You are countering teachings that have been around for decades and it’s anything but simple or easy. Try something new, make mistakes, learn from it, and try again! You’ve got this. Do you have any other tips that you would suggest? Feel free to leave them below… I’d love to hear them!